What do you do when you’re plodding along in Microsoft PowerPoint and realize that the slides you’re trying to create probably already exist in some other presentation somewhere? You borrow the slides from the other presentation. You can still steal slides that way — in fact, Microsoft has created a special command that makes it easy to steal slides directly from another presentation. But if you steal slides often and want to become a career criminal, the real way to do it is to set up a slide library, which is a central repository for slides. The slide library lives on a server, so anyone can access it, and it’s managed by SharePoint, so it has a bunch of nice SharePoint-like features. 1. Open the presentation you want to copy slides into (not the one you want to steal the slides from). This step displays a Reuse Slides task pane, which appears on the right side of the screen, as shown. The Reuse Slides task pane lets you steal slides from other presentations. 3. 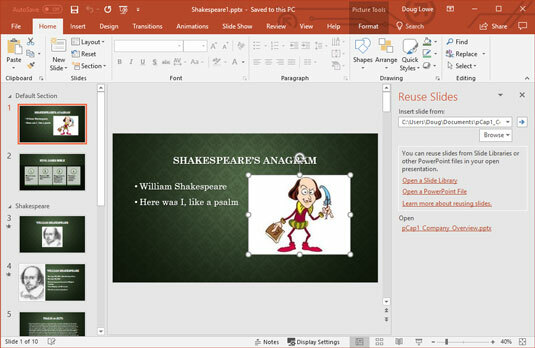 Click the Open a PowerPoint File link in the Reuse Slides task pane. 4. Locate the presentation you want to steal slides from and then click Open. 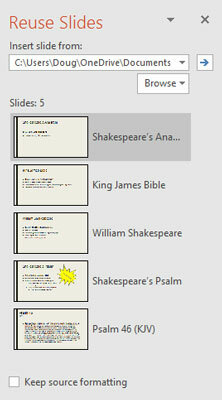 The slides from the presentation you selected are displayed in the Reuse Slides task pane, as shown. You’re now privy to one of the coolest effects in PowerPoint: When you point at one of the slides in the Reuse Slides task pane, the slide magnifies to twice its original size so you can better see the contents of the slide. 5. (Optional) Select the Keep Source Formatting check box if you want the slides to retain their original formatting. Normally, you should keep this option deselected. With the option deselected, the slide assumes the theme of the presentation it is inserted into. 6. Click the slides you want to steal. 7. When you’re done, click the X at the top right of the Reuse Slides task pane to dismiss it. That’s about all there is to stealing slides from other presentations. If you’re lucky enough to work at a company that uses SharePoint, you have several additional PowerPoint features at your disposal. One of the most useful is the capability to create and use slide libraries, which are special types of document folders that store individual slides, not whole documents. When you’ve saved slides in a slide library, you can easily insert them into a presentation. And as an added bonus, you can have PowerPoint check to see whether the slides have changed and automatically update them with the changes. Pretty cool, eh? 1. Open the presentation that contains the slides you want to add to the library. 2. Choose File → Share → Publish Slides; then click the Publish Slides button. 3. Select the slides you want to add to the library. 4. Enter the URL of the slide library in the Publish To text box. 6. (Optional) Play a game of Solitaire. Open the presentation you want to copy slides into (not the one you want to steal the slides from). Click the Insert tab on the Ribbon and then click the New Slide button and choose Reuse Slides. This step displays a Reuse Slides task pane. Click the Open a Slide Library link in the Reuse Slides task pane. This step summons a Browse dialog box. Locate the Slide Library you want to steal slides from and then click Open. The slides from the presentation you selected are displayed in the Reuse Slides task pane, in the same way that slides from a PowerPoint file are shown. (Optional) To keep the original formatting for the slides, select the Keep Source Formatting check box. Normally, you should keep this option deselected. Click the slides you want to steal. Each slide you click is added to the presentation. When you’re done, click the X at the top right of the Reuse Slides task pane to dismiss it.